1. Place a wire rack over a baking pan. 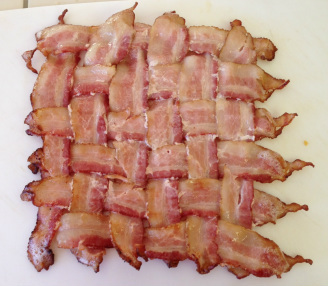 Weave the bacon together on the rack (see photo below). 2. Bake at 400F until starting to crisp. This will be between 5-15 minutes depending on bacon thickness. 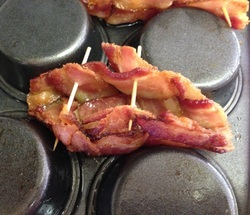 If your bacon starts to curl you can place another baking rack (upside down) on top of the bacon to help keep it flat. 3. Remove bacon from oven and place on a cutting board. The easiest way to do this was for me to place the cutting board on top of the bacon, place one hand on top of the cutting board and one hand under the wire rack, squeeze them togeher and flip the whole thing over. And don’t forget to do oven mitts when you do that!! 4. Cut bacon into desired shape and size (I suggest cutting it into 4 squares) and place in between the cups of an upside down muffin tin. Use toothpicks to hold the shape if needed (see photo below). 5. Bake for another 5-15 minutes or until crispy. 6. Carefully remove shells and place on a plate. Remove any toothpicks if you used them. 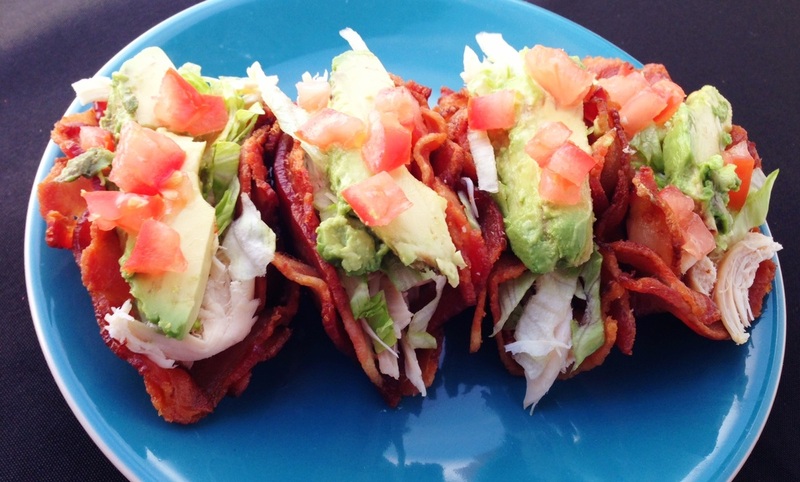 Fill with shredded chicken, lettuce, avocado and tomato and serve with your favorite paleo hot sauce or salad dressing (optional).